Bible News Prophecy Magazine: Blood Moons: Will Jesus Return in 2014? Now also in Kiswahili! The latest edition of the Bible News Prophecy magazine put out by the Continuing Church of God is now available. A fifth language is now available, Kiswahili! 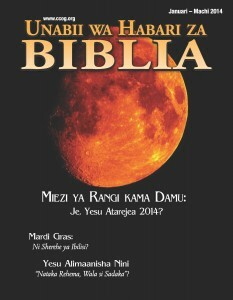 The cover shown above is from the Kiswahili version. Here is a pdf. link to the version in Kiswahili: UNABII WA HABARI ZA BIBLIA: Jan-March 2014. Various editions of the magazine are available in English, Spanish, Tagalog, Mandarin Chinese, and now Kiswahili. Here is a pdf link to the English version of the January-March 2014 edition of Bible News Prophecy magazine. 3 Christians Have Taught the Gospel of the Kingdom Did first and second century Christians understand and teach about the kingdom of God? What about Christians in the 20th and 21st centuries? 10 Blood Moons: Will Jesus Return in 2014? “Blood moons” are expected in 2014. Do they possibly mean that Jesus will return in 2014? 15 Study the Bible Course Lesson 1: Why Study the Bible? This is the first lesson of the course to help people study the Bible. 21 Mardi Gras: The Devil’s Carnival? Mardi Gras appear to be growing in popularity. Some believe it is a party for Christians. But is it? 22 What Did Jesus Mean – “I Will Have Mercy, And Not Sacrifice”? According to Jesus, mercy is one of the “weightier matters of the law” (Matthew 23:23). Here is an old Good News article (which cites the KJV) about it. 31 Keeping the Days of Unleavened Bread How and when? Again, here is a pdf link to the January-March 2014 edition of Bible News Prophecy magazine. Continuing Church of God The group striving to be most faithful amongst all real Christian groups to the word of God. Here is a link to its website in Mandarin Chinese: http://www.ccog.asia (0ther language sites are in progress). Blood Moons and Prophecy There are four ‘blood moons’ expected in 2014 and 2015. Do they signal the Day of the Lord or the return of Jesus Christ? A related YouTube video is also available: Blood Moons, Prophecy, 2014, and 2015. Mardi Gras: The Devil’s Carnival? Is Mardi Gras Christian? Do you know that in Bolivia the carnival/Mardi Gras time is part of a celebration known as the Devil’s Carnival? Where did it come from? Keeping Passover and the Days of Unleavened Bread How should Christians keep Passover, especially if they are by themselves. Why does the Church of God not require lambs for Passover? How does one keep the Days of Unleavened Bread? For a step-by-step video for Christians to keep it, check out CCOG Passover Service. Statement of Beliefs of the Continuing Church of God “Contend earnestly for the faith once for all delivered to the saints” (Jude 3, NKJV), “Let brotherly love (Philadelphia) continue” (Hebrews 13:1) “…continuing stedfastly in the teaching of the apostles” (Acts 2:42 YLT). So, what does that really mean in terms of specific beliefs? This entry was posted on Monday, January 20th, 2014 at 6:02 pm	and is filed under COG News. BibleNewsProphecy: Mardi Gras & Carnaval: Are they for Christians? St. Patrick’s Day going gay? Sermon: Which Spring Days should Christians observe? Which Spring days should you keep? Which days this season should you keep?